Get the best price and avoid unnecessary traveler and booking fees by booking direct with Sunset Properties. Imagine vacationing on the beautiful Gulf Coast in luxury accommodations while you relax on your balcony hearing the waves crash against the shore. Well, all this and more is available to you at Sunset Properties. We offer a wide variety of luxury and affordable Alabama Gulf Coast rentals, including condo and beach house rentals. All of our Gulf Shores rentals provide guests with utmost comfort and amenities. Enjoy waking up each morning and seeing beautiful views of the ocean when you stay in any of our Gulf Shores, Orange Beach or Fort Morgan rentals. If you want a laid back vacation you may want to consider a Fort Morgan vacation rental, you will be within a 2 mile walk down to the island tip where the Gulf of Mexico and Mobile Bay converge. If you are interested in being closer to where the action is, we recommend staying in one of our Gulf Shores or Orange Beach rentals. Our list of different Gulf Shores, Orange Beach and Fort Morgan vacation rentals can sleep anywhere from 3-20 people comfortably, and some of our Fort Morgan vacation rentals are also dog friendly. Whether you are looking for a Fort Morgan rental on Mobile Bay or a Gulf Shores rental on the Gulf of Mexico, we guarantee that your stay at one of our vacation rentals will be one to remember. 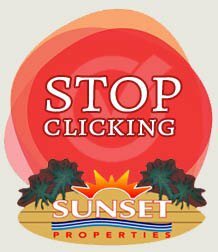 Sunset Properties is a family owned and operated vacation rental company and has been providing Gulf Shores rentals since 2001. Our favorite job is helping you create memories that will last a lifetime! We can also provide you with local recommendations on where to go, what to do, and where to eat in the Gulf Shores area.